A new book detailing the rise and fall of New Zealand towns appeals to the head and heart in equal measure. The old adage ‘to know more is to grow more’ expresses well the need for us to grow by knowing what is happening, not just in our neck of the woods, but in other communities in other parts of the country over time. (self-published 2017) by Hugh Dickey and 50 contributors. The book, The Growth of New Zealand Towns by Hugh Dickey, helps the reader to do such an exercise. Written in two parts, the first outlines key statistics while the second half of the book has locally-written articles on 50 cities and towns by knowledgeable contributors. Each is well illustrated. These give valuable insights into the development and subsequent continued growth or decline of each place. Local heartbreak, determination and optimism are clearly seen in some of these. As LGNZ president Dave Cull says in his foreword to The Growth of New Zealand Towns, “This book highlights the ability of our communities to innovate and adapt as economic and social change has eroded the basis of their long-term prosperity. In the first half of the book, author Hugh Dickey gives an overview of the growth of our nation’s towns, based on his extensive population research. This too is presented in a highly visualised manner. All kinds of interesting insights are provided, including the “seasons of growth” of each town. Another marker is the date from which the population of each town has doubled to its 2013 census level, giving a relative “age” of the town. 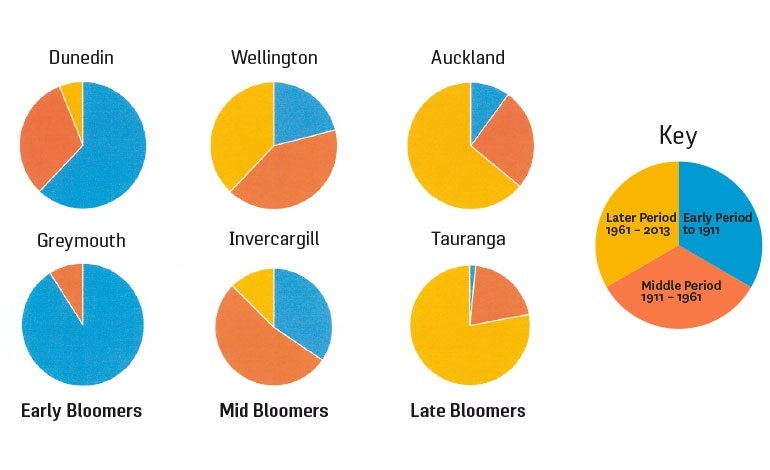 A valuable chapter on the history of urbanisation in New Zealand clearly shows that a majority of our population were town dwellers as far back as 1881; much earlier than was traditionally thought. It also shows that urbanisation has now halted and that the fastest growth is often in rural areas surrounding major centres. The author’s comment is that many people are seeking the best of both worlds – a semi-rural lifestyle, yet with access to urban facilities and employment. Councils that allow smaller (one hectare) blocks will capitalise most on this new growth trend. Other sections that are significant for local government are those that explain factors of change in towns, and the guest article ‘A Glimpse of the Future’, which tells of the hidden elephant in our rooms – the inevitability of internal demographic change that will lead to population loss, but which we are often reluctant to acknowledge in public. Several appendices of detailed data supporting the research in this book have been added at the back where, according to the author, they will stop general readers from drowning in statistics, but will provide an invaluable research tool for those interested. This is a must-read book for all elected representatives to broaden their knowledge of our townscapes, along with senior council staff, especially those involved in planning and future issues. Author Hugh Dickey has divided the population growth of every town into three periods of about 50 years each. Those that saw most of their growth before 1911 can be classed ‘early bloomers’, those that grew mainly from 1911-1961 are ‘mid-bloomers’, and those that have grown mainly since then are ‘late-bloomers’. Two examples from each category are given right.